Drum n Fire Music GLampout on the sandy wooded beaches of the Illinois River. Every Campfire will have a different rhythm. Campfire hopping at its best! Acoustic guitar(campfire), drum circle(campfire), music video tribute are just a few of the events. This event is perfect for the first time GLamper! In order to guarantee your spot you must book online through the links below ASAP. $69 per person includes all Music GLampout festivities and the guided kayak tour. For the Safety/Comfort of our other guests Dogs are not allowed. Make sure you book online through the links above as last year all of our GLampouts sold out. Forget something? Jewel or Walmart is a mile away! IS HAPPENING JUST A 4 BLOCK WALK FROM KAYAK MORRIS IN DOWNTOWN MORRIS! HERE IS THE SCHEDULE OF EVENTS! 9:00am – 5:00pm – Chalk the Walks – Visit your favorite downtown businesses for great shopping and more! Many businesses will have sidewalk chalk and art related activities throughout the weekend. 10:00am – 3:00pm. – Grundy County Historical Society and Museum – 510 W. Illinois Avenue – Stop by and bid on beautifully framed Hargrove prints of railroad engines. 11:00am – 4:00pm – “Creator’s Village” – Grundy County Courthouse Lawn – Pick up your Creators Village Passport in the “Greeting Booth” and let your adventure begin! Kids of all ages can express their creativity with a variety of mediums. Be sure to have your passport stamped in each booth to receive a prize to take home with your bag full of art projects! Click here for more information! 10:45 am – “The Boy Who Loved Words” – Grundy County Courthouse Lawn – Don’t miss the Performance In The Round, brought to you by the Joliet West Speech Team. 11:00am – 6:00pm Train Rides – Boarding at the Grundy County Courthouse – $3.00 per ride will benefit the Christian Youth Center of Morris. 11:15am – “The Boy Who Loved Words” – Grundy County Courthouse Lawn – Don’t miss the Performance In The Round, brought to you by the Joliet West Speech Team. 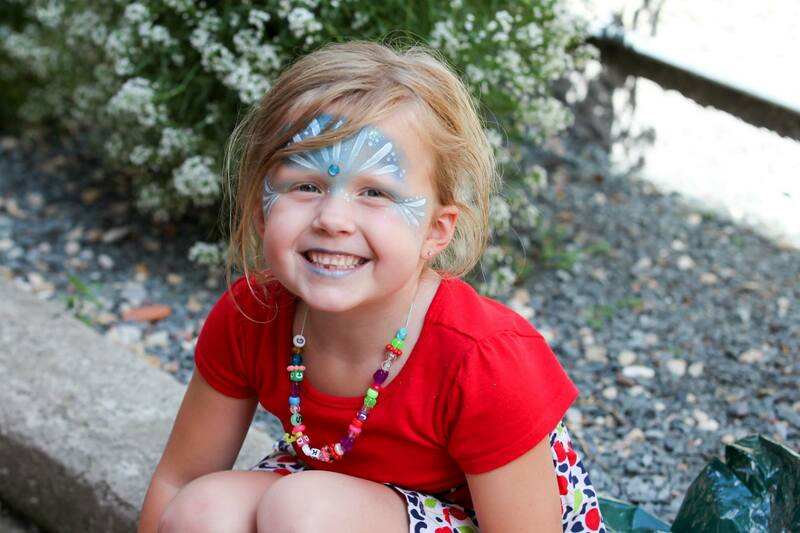 Noon – 3:00pm – Face Painting – Courthouse Lawn – Free! 1:30pm – 4:00pm – Ice Cream Social – Grundy Bank Courtyard – Stop by for some ice cream and enter the coloring contest to win a basket full of art supplies! 1:30pm – Donna Mueller’s School of Dance – Grundy County Courthouse – Don’t miss the Pizazz Dancers! 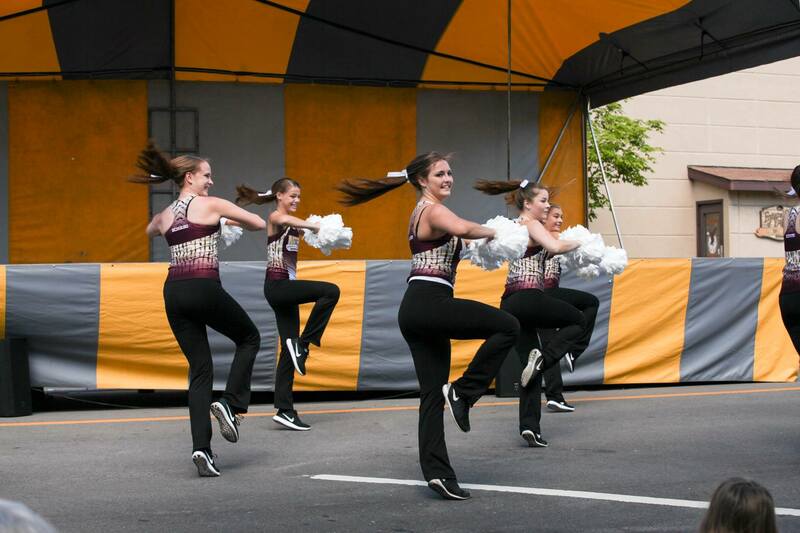 2:00pm – Morris High School Poms – Grundy County Courthouse – You won’t want to miss this great performance! 3:00 – 4:00 – Alexus Maldonado – Grundy County Courthouse Stage – Alexus will be bringing her original rock and alternative music to the festival. You won’t want to miss hearing this talented singer/songwriter! 4:00pm – 6:00pm Vinyl Record Exchange – Clayton’s Tap – 122 W. Washington – Swap, trade or give away your vinyl musical treasures! Record players will be on hand to demo your new tunes! Many vinyl record up-cycling ideas presented. Sleeveface selfie station available and much shenanigans encouraged. Click here for more information! 6:30pm – 8:30pm Concert – “Six String Crossing” – Grundy County Courthouse Stage – You’ll love listening to rockin’ country songs that you may be hearing for the first time as well as the hit songs you know and love from yesterday and today. Rain location is Living Water Church of the Nazarene, 118 E. Jefferson. 9:00am – 10:00am – Zumba at the Courthouse – Music and dance will come downtown early this morning! Instruction provided by Limitless Fitness. 10:00am – 4:00pm – Art Walk – Washington Street one block east and west of Liberty, and Liberty north of Washington Street – Visit the Fine Art Walk and separate Hand Made Market. The Fine Art Walk is juried and 1st, 2nd, and 3rd place winners will have ribbons displayed. 10:00am – 3:00pm – Watercolor Painting – Courthouse Lawn – Don’t miss this opportunity for one-on-one watercolor instruction! Members of the Morris Watercolor Guild will teach adults, teens, and pre-teens interested in watercolor. 10:00am – 3:00pm. – Grundy County Historical Society and Museum – 510 W. Illinois Avenue – Stop by and bid on beautifully framed Hargrove prints of railroad engines. Free trolley ride stop! 11:00am – 6:00pm – Train Rides – Boarding at the Grundy County Courthouse – $3.00 per ride will benefit the Christian Youth Center of Morris. 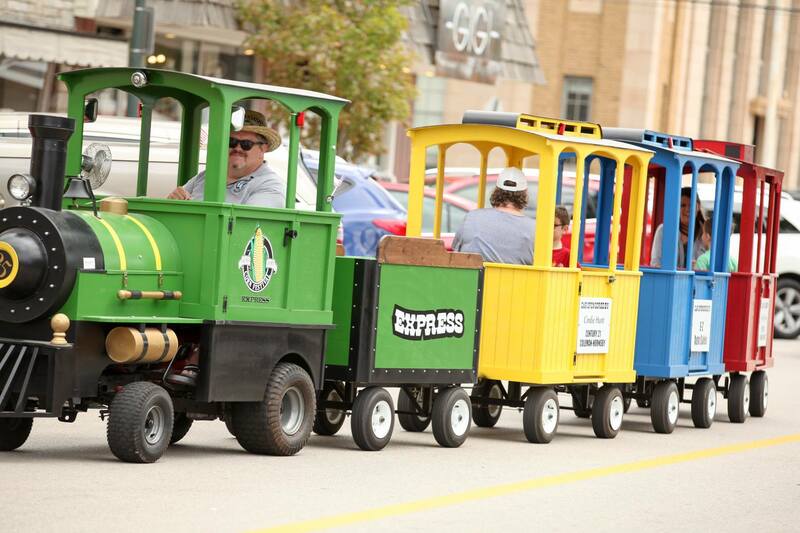 11:00am – 5:00pm – Trolley Rides – Boarding at Grundy County Courthouse, Grundy County Historical Society and Goold Park – Free trolley rides will transport you to some of Saturday’s exciting events! 11:00am – Storybook Character Parade – Meet at Morris Area Public Library – 604 Liberty Street – Children and parents are invited to dress like their favorite story-book character illustrations and parade from the library to the courthouse! 12pm – 12:45 – Selections from “Dogfight” – Grundy County Courthouse Stage – Enjoy musical selections from Small Town Theatrics’ summer production! Visit www.smalltowntheatrics.org for more information. Noon – 3:00pm – Face Painting – Grundy County Courthouse Lawn – Free! 1:00pm – 6:00pm – Shine Music Fest Christian Music Experience – Goold Park Band Shell – Be uplifted and inspired by a variety of contemporary Christian music from area musicians. Free trolley rides will be available to transport attendees to and from the courthouse. Bounce House for kids! Rain location is Living Water Church of the Nazarene, 118 E. Jefferson Click here for more information! 1:00pm – 2:00pm – Natalie Colleen – Grundy County Courthouse Stage – Don’t miss this young vocalist! 2:00pm. – Grundy County Historical Society and Museum – 510 W. Illinois Avenue – Stop by and hear Rick Bussey sing railroad songs! Free trolley rides to the museum from the courthouse and Goold Park! 2:00pm – Madison Grace – Grundy County Courthouse Stage – You won’t want to miss Madison’s acoustic guitar with pop and country vocals! 3:00pm – 4:00pm – Ethan Sink – Grundy County Courthouse Stage – Come see this great vocalist/keyboard artist! 5:00pm – 6:00pm – Got Soul Jazz Quartet – Grundy County Courthouse – Featuring talented musicians from the First Presbyterian Church of Morris. 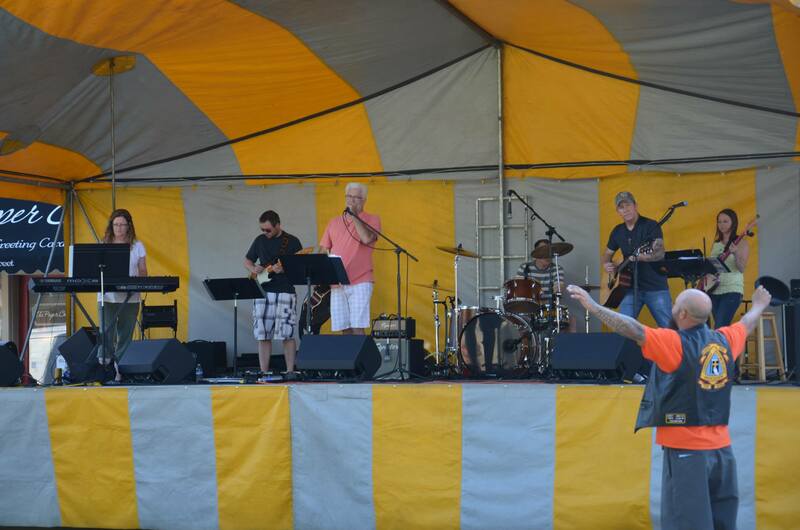 6:30pm – 8:30pm Concert – “Good Clean Fun’s – Life’s a Beach” – Grundy County Courthouse Stage – from Beach Boys to Buffett, from Calypso to Don Ho, you will be transported to the beach during this fun concert! Rain location, Morris High School Auditorium.